As you can see in this pic, I made another liner for my envelope so it can match my cutie card perfectly! If you watch my video today, I show you another cute way on how to close up my 3x3 envelopes using 2 brads just like you see here in my pic! Up next is this FUN Gift card holder! For this I used the shorter jar again, but only added the material and not the lid this time! Do you think those are REAL coffee beans? Well, if you are thinking.."maybe", you are right! I hot glue gunned down the coffee beans & not only does this gift card holder smell YUMMY, but just think this person now has a giftcard to Starbuck's where she can go pick her self up a cup.. "on me"! ;) Isn't that little tag the CUTEST EVER?? That tag along w/the sentiment is also included in the "Chunky Jar Accessories"! I also used the "soon to be released "Stitched Button Dies"! I really kept this one super simple & I love how it came out! Okay, I just LOVE how this last card came out! 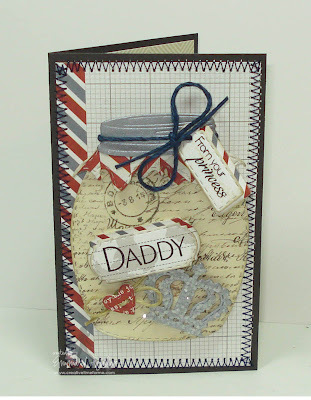 I used the new Teresa Collins "Far and Away" 6x6 pad. 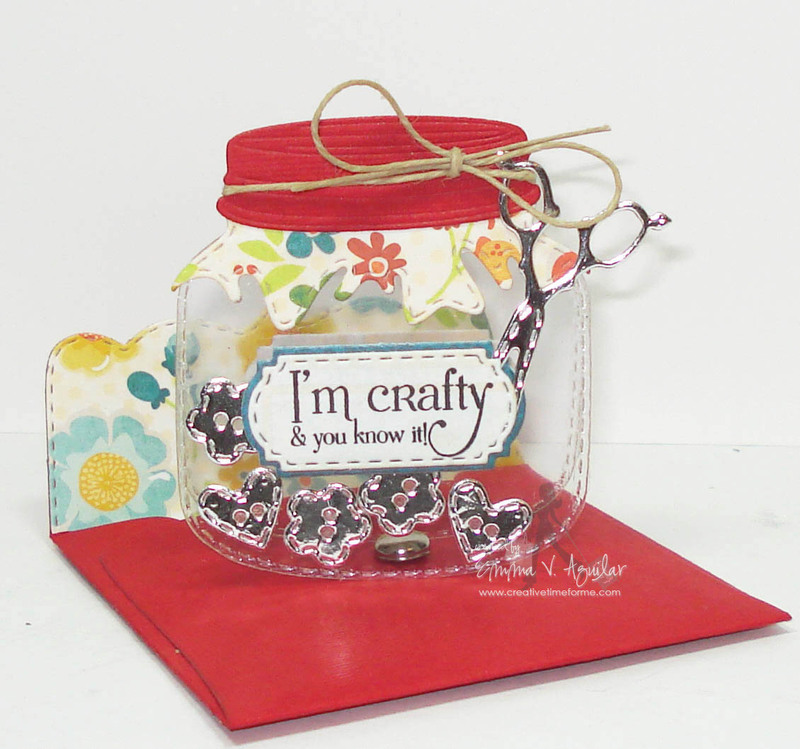 For this card I used the taller chunky jar & this measures approx 3 1/4 inches tall & w/the handle it measures approx 4 3/4 inches tall. What a precious card for a little princess to send her Daddy who is overseas or just away for work. 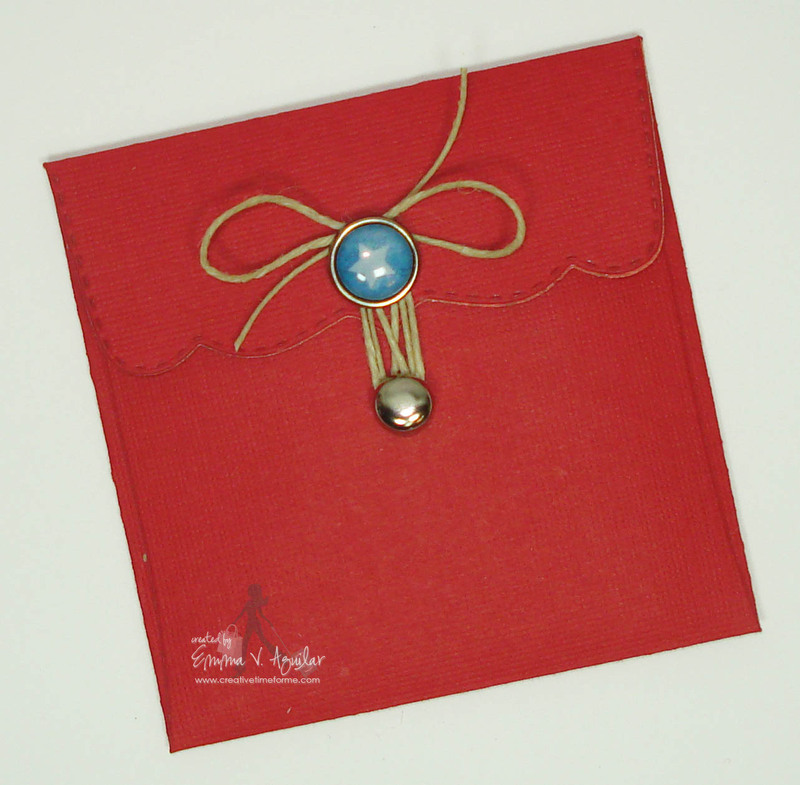 The inside of the card reads "Miss You". You can make just about ANYTHING w/these fun new dies! Both set of laying labels AND the cute little sparkly crown are all included in the "Chunky Jar Accessories". *** This time around we are doing something a little bit different this time around! ;) All you have to do is leave comments on our blogs! You do NOT have to comment on every blog, BUT if you do, you will just have more chances to win! The thing we are switching up this time is that random.org will be picking a winner that night & announcing the winner the next morning! Example: for Monday's sneak, leave your comments here & share on facebook, then I will annouce the winner (for Monday) Tuesday morning! That means a winner will be anounced every day during sneaks! I can't get enough of this release!! :D Let's skip this week and go straight to Friday!!!!! OMG, I love those dies, great sneaks Emma, you and ur DT are doing a great job! You are outdoing yourself! This is an amazing release. Love all the projects. Thanks ladies!! I am IN LOVE with the jar and the dies! It's just too cute for words! Sharing on FB! I am in LOVE!!!! I can't wait for this release!!! Can we go straight to Friday! I really want the dies and stamps you have shown! Emma, you and the design team have outdone yourselves!!!!! I have so been wanting a jar die! I love it! If you are looking for suggestions I would love to see window and door dies too. Thanks Emma for another amazing release. WOW!!! How fun are these!!! I LOVE all the dies you are coming out with Emma...and those sentiments....AWESOME!!!! Your projects are over the top just again!! Thanks for ALL your inspiration and another amazing day of sneaks!!!! WOWIE WOOOO Just got back from the hop!! What a group of extremely talented gals they sure served up awesome ideas. Emma I love your project with the jars gosh how clever are you to have come up with the ideas for jars and all the accessories this is exciting oh heck the whole release is exciting can't wait and am so looking forward to tomorrow 2 C what else you and your DT have to share. At least I'm getting lots of exercising doing all of the hopping! Love all of the jars!! Off to check out everyone's blogs! Wow....Emma THIS SET is ABSOLUTELY ADORABLE!!! OMG! These are so cute and I can use them NOW. My son's wedding is based on Mason jars and Keys, these already give me an idea for something we have been searching for. You are so smart Emma, Thanks for all your talent and sharing with us. I'm so excited now I can't wait to get my hands on them. These sneaks are killing me, can't wait for the real deal !!! Everyone's are so cute. Emma, I love this chunky die set...cannot wait until tomorrow when you show case the little accessories that go with it...I am sharing this with my sister and friends...I hope to win this set I LoVE IT! I am loving these stitched chunky jars! So adorable and such the in thing right now. Your projects, as always, are amazing! Thanks for continuing to impress us! These peeks are just so awesome, can't wait for Friday! OMGosh and I thought you had me with the other sneaky peeks! I am so loving todays peeks!! Love, love the jars and the other goodies for the jar! I'm just so excited over this release! WOW, I'm loving all these projects. This release looks amazing. That jar is adorable, love the scissors and the key. Your projects and The Design Team's projects are all fantastic. Love all the creativity. What a great sneak peek! I love how every project had a jar and they were all so different-can't wait to get my hands on this set! Another great display of your soon to be new release!! Emma you & your amazing design team out do yourselves each & every time!! Can't wait to get this set along with all the others!! Can't wait for more!! Your cards are so cool! 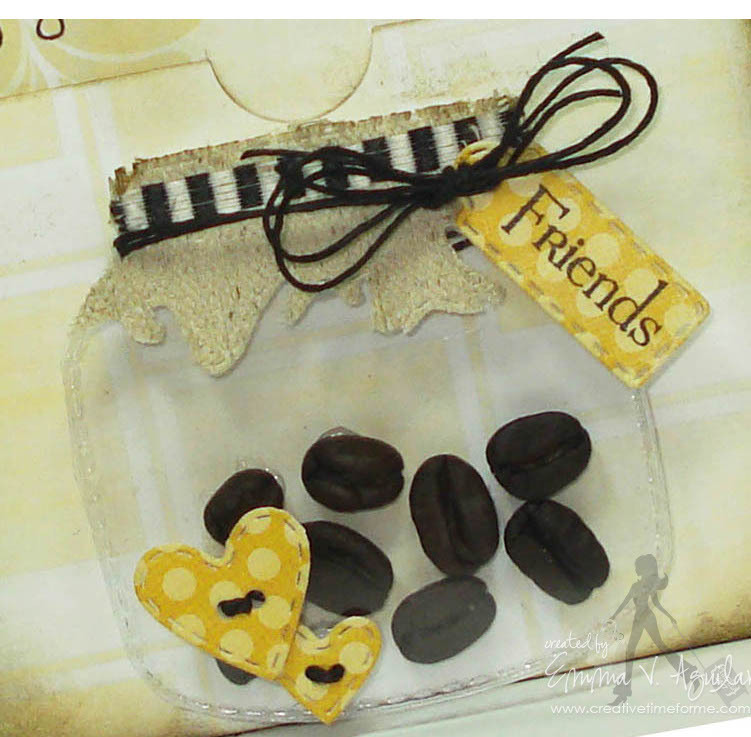 I especially like that you used real coffee beans for the Starbucks gift card holder - what a great added touch! AWESOME projects! Emma, you are going to laugh when you get your mail from me; great minds think alike! I just adore these sets! oh my gosh, love these!! how creative, Emma!! OMGosh, what an awesome set of dies. I can't get over how cute these are and how versatile they are. Another awesome release my friend. Can't wait to see it in it's entirety. Again, such wonderful projects by you and your DT! I can't wait to see the entire reveal. I'm going to have to save up for quite a while to get the things I'd like to get from this release. Super cute. I can't get over all the great dies for this release. I want this one too. Okay...you've REALLY outdone yourself now!!! Doilies AND Jars?!?!?!?! 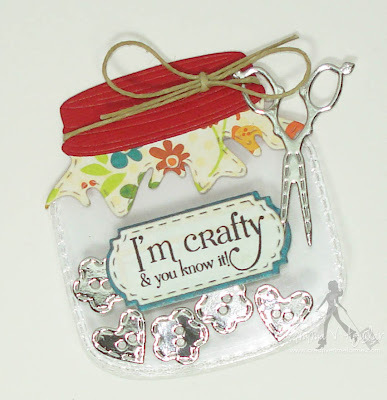 LOVE LOVE LOVE these new jar dies! They are FABULOUS!!!!! Love the new dies. So many possibilities! Beautiful projects from the whole team. Shared on facebook. WOW, Wow, Wow Emma! You have really out done yourself with all the dies! Love the new jars and all the little accessories. I can not wait to get these release. Simply AMAZING! Thank you for all your hard work - your projects are fabulous. Wow!!! This release is awesome!! 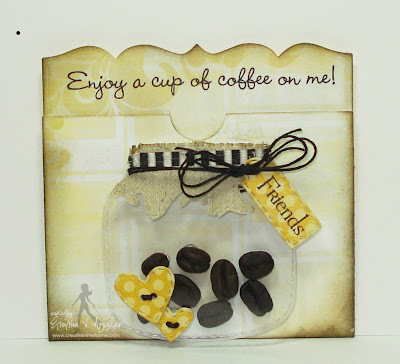 Your cards are gorgeous and I love how you used the coffee beans on the gift card holder. Love your canning jar designs! The little handles are great accents, can't wait to see the full release! OH my goodness above and beyond awesome. LOVE the jars and the great ideas. Thanks Miss Emma. OOOH! I love sewing supplies, the button dies are great and the showcase was fun, thanks ladies! Oh my word! Everything looks wonderful - and that little canning jar - be still my heart ♥♥♥ Wonderful, inspiring, creative projects by your Design Team, off now to get a better look! Oh my word, I am loving those jars!!! You all did a fabulous job on your projects.. I am so inspired.. Screaming!!!!!! Aaaaaaaaa I love this. Super super cute!!!! I have plans for this one! Thank you for sharing. So THIS is what it means when they say you're "killing me slowly"...ARGH! Did you seriously just say "10 small dies"??? Be still my heart. I hope you ordered a double order this time because I see a quick sell out in your future! Congrats on an amazing creation! LOVE THESE! OMG these are too stinkin' cute!! With all the new CHA collections and now your awesome stuff, I'll be filing for bankruptcy soon - lol! OMG! Emma all those dies I have seen I really really love them! I can't wait till Friday to place my order, your DT is doing an excellent job. Awesome dies!! So many possibilities! My mind is just racing. Love it!! Emma, this is just a fabulous collection. I love everyone so far. Oh my goodness Emma...you really ROCKED this set!! Totally Awesome!! I want this set sooooo bad and can't wait to order.....I love it! Awesome job!! Wow, this release is going to be awesome. Love the jars and all the little ideas with them. YAY! a jar I hoping you would come out with jar. Can't wait for Friday hopefully I can place my order before they all sell out because I think everything is going to go fast. Wow Fabuloso! This release so far its soo cute. Can't wait to get my hands on some of these. The jars are so stinkin' awesome. Great job on another great release. OMGoodness...this release is awesome Emma.These jars are my favorites ever! !Can't wait to get hold of them! OMG This is all so fantastic. These peeks are amazing. Can't wait for the release. Oh Emma the jars are so cute!!! this is for sure going on my wish list....enjoying the sneaks!!! HI Emma,This is so Super Duper AWESOME! !Never thought a jar could be so adorable! !You ROCK!Great job on this release!! Emma all your cards were amazing, I loved them all. OMG I cant wait for your release, Im so going to have to ask for it as B-day gift:)lol. OH Emma!! You really outdid yourself with this jar die set! I LOVE LOVE LOVE this set! And it is at the top of my wishlist!! Fabulous Projects!! Oh my gosh Emma, I hope you stocked up for this release, cuz I KNOW these will be FLYING OUT THE DOOR!! I will be waiting up all night if I have to, to make sure I get these the moment they go on sale!! This release has completely blown me away! I LOVE EVERYTHING!!! I can't even explain how excited I am about this release!! 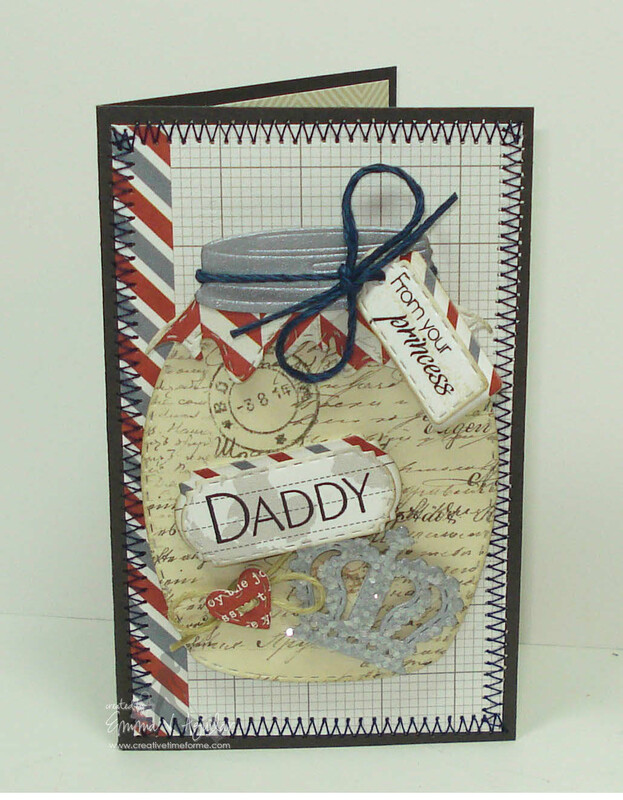 You and the DT have done an incredible job showcasing the endless possibilities of all the stamps and dies. Friday can't get here soon enough!! so Ms. Emma, I don't even know what to say.....but WOW!!! oh my!! I LOVE LOVE LOVE everything I have seen thus far!!! this new release looks like it will be the BEST ONE YET!! and I have love all of them so far!!! AND this is only Day 3! LOL all I can say is this is torture, cause I am so ready to order this release!! can't wait and keep them coming! I absolutely love the jar dies. How stinking cute!!! You outdid yourself this time!! LORDY, LORDY...how awesome are these jars!!! Oh my gosh I love them, can't wait to get my hands on them!! They are perfect for my mom and mother n law!!! So amazing Miss Emma!! :) I can't wait for tomorrow!! Each day gets better and better--love the jars!! oh I love the jars, you releases get better and better every time, I love all the projects. I love the jars and can't wait to get my hands on this one! All your cards are so adorable and the ideas are flowing though my head as well. What a great sneak peek, I like all the new dies!! Till tomorrow! Wow all the projects are amazing!! Wow amazing project, love the coffee been one. This looks like an amazing release can't wait more. Great projects. I also love how jars look when used in crafting in this way. Congrats to Annette! I love the jars and the accessories are amazing. Your projects are adorable! Great ideas! LOVE that cute jar... so versatile! Oh my gosh, what a release!!! These are fabulous and Emma your cards are sensational! DT, wow so amazing!! Emma, this looks great! Can't wait for Friday! Heading to FB now! Looks like a wonderful release! Come on Friday! WOW!!! You areso talented and amazing!! I can't wait until friday. LOOOOOOOVING this release already!!! Fabulous job Emma as always! Emma, you just amaze me! Loving this release and can't wait to get my hands on it!! super sweeeet projects ladies. OMG Emma I love this die set. thanks for showing the die set. I cant wait for this die to go on sale Im excited your release is FABULOUSS as always. The jar dies are so adorable. So many thing you can do with them. I solo want these dies! I can't wait till Friday. OMG-I am totally speechless. The jar set is just amazing. Love all three of your projects, but using the coffee beans on the gift card holder was pure genius. Love this little jar, soo cute!!! I know these dies are going to be a big hit.So cute. Matching envelopes and real coffee beans...all of your projects are wonderful. The Design Team had so many beautiful projects and ideas too. Wish Friday will get here so I can place my order. So much to love in this release. Great job everyone. Congratulations to the winner Miss Annette! What a great release so far. I'm loving it! All your sneak weeks are so great. I'm loving everything I'm seeing can't wait for the release. Love the creativity of your design team and you..
OMG, I want this set!!!! You gotta pick me! I always look forward to your release as there are always dies and stamp sets I must have! Tks for the inspiration. Emma ~ OOOMMMGGG! Okay I am on TOTAL overload right now! I just saw your projects ~ I LOVE them! That REAL coffee bean jar gift card holder is to die for! So CLEVER!! Then of course I LOVE the CUUUTE little acetate jar card! Of course the shiny paper too! LOL! Those sissors & buttons ROCK with it! 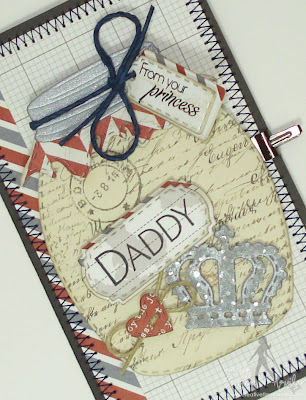 Then my FAVORITE ~ the ard for a DAD! The papers with all the MCT products ~ just won my heart! Everyone did such an AMAZING job too! What another fun set to have!!! Love the new release it is amazing. is it next week yet i want to do some new projects.